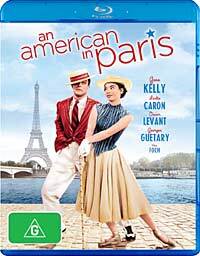 An American in Paris makes use of George Gershwin's 1925 concerto by the same name, impressive staging, excellent dancing from Gene Kelly, to provide an Oscar-winning musical romantic comedy. Although a secondary character, Oscar Levant is the highlight. His mid-movie performance of a section of Gershwin's 'Concerto in F' shows the difference between an actor faking piano playing, and a high-class pianist doing it for real. This movie scores 192kbps Dolby Digital 1.0 audio treatment. Not all that thrilling for a musical, but what can you do in the absence of separate tracks or other elements? While I'd have rather seen this as Dolby TrueHD 1.0 (Warner's preferred lossless format), I doubt that the Dolby Digital did any audible damage. That's because by today's standards, the original sound was crap. It is harsh and bandwidth-limited. That doesn't make this movie unenjoyable. Just don't expect high fidelity. I examined the frequency spectrum of the five minute 'Concerto in F' section. With modern recordings the level of the sound falls of as frequency increases at 3 to 6dB per octave. With that roll-off, it just sounds right and natural. With this recording, the level remains within a 12dB band for the full seven octaves from 40 to 2,500 hertz. Above that the roll off starts, but there are huge notches at 9,500 and 15,600 hertz. These are the kind of things you see with (usually futile) attempts to retrieve high frequency information from old recordings. There must have been some nasty stuff at those frequencies which had to be filtered out. Below 40 hertz there is nothing. It's as though a very hard high pass filter were applied at that frequency. The 1951 MGM cartoon included as an extra contrasts with this sound. It has virtually no bass below 80 hertz, has a similar frequency balance to 2.5kHz, and at 5.5kHz drops rapidly away to be buried in the noise floor by 7kHz. The picture is presented in full high definition, in its original 4:3 aspect ratio, pillar boxed within a 16:9 frame (the Blu-ray specification doesn't provide for 4:3 HD material). It's colourful, and quite sharp, and almost entirely clean of dust speckles, if a little grainy. Even on my 2.12 metre projection screen it looked impressive.